The Subaru WRX is a precision rally car in street car guise. What do you need to know before you buy a Subaru WRX? Don’t worry, we’ll tell you in our Ultimate Buyer’s Guide. WRX stands for “World Rally Experimental,” and since its inception, the WRX has been an absolute hoonmobile. The formula has remained the same since the original WRX rolled off the line in 1992: turbocharged flat-four, all-wheel drive, finely tuned suspension, and an available manual gearbox. WRXs have been and continue to be among the best handling vehicles you can get for the money, especially when asphalt turns to dirt. The 2015 WRX was the first model year of the new generation WRX. The new car is built on a new, stiffer, longer platform and is only available in sedan form. There’s a new, much updated interior and the non-STI gets a fresh 2.0-liter boxer four cylinder engine, a new six-speed manual transmission, and a Continuously Variable automatic transmission option. Also new for ‘15 was electric power steering, a new active torque vectoring system, a retuned suspension, and larger brakes. The STI trim also got suspension tweaks, but it continues to make do with last generation’s 2.5-liter boxer engine, the same six-speed manual as before, and hydraulic power steering. It, too, got the new torque vectoring system, as well as the carryover Driver Control Center Diff. After the major update in ‘15, the 2016 WRX only receives minor tweaks. All WRXs except for the STI Limited now get a 6.2 inch Starlink multimedia display. The STI Limited gets a larger 7 inch display, blind spot monitoring, rear cross traffic alert, Harman Kardon speakers, and Navigation as standard. The Premium and Limited WRX get 18 inch wheels for 2016. The last update for 2016 is Subaru’s available Eyesight driver assist technology, which includes adaptive cruise control, pre-collision braking, and lane departure warning. So, how about those horsepowers? Those are usually helpful when you’re driving a sports car. Well, good news: there’s plenty. The two-liter boxer four was all new for 2015, cranking out a healthy 268 horsepower and 258 lb-ft of torque. That’s not much of a difference over the last generation’s power and torque numbers, but the direct-injection FA engine offers significantly better fuel economy than the outgoing model. Of course, the STI engine still has a bit of an edge on the 2-liter, winning out in horsepower by about 40 and in torque by about 30. Still, the difference isn’t going to be hugely noticeable. 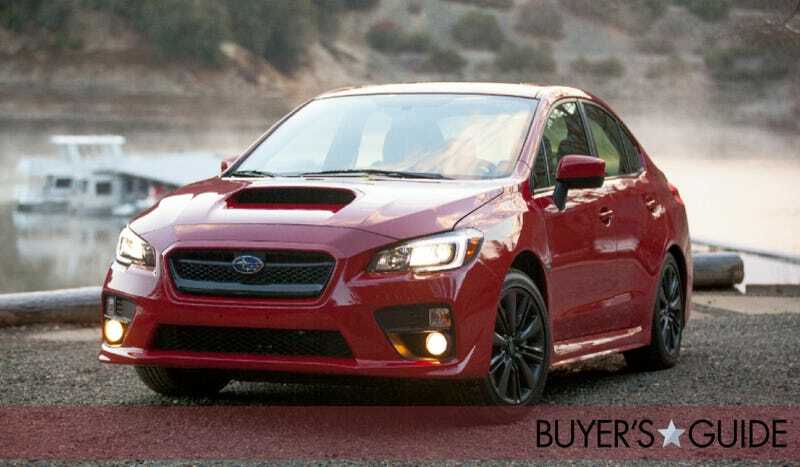 Gas mileage has never been the WRX’s strength, but that changed with this new generation. Unlike the old model, which could barely eke out 25 MPG on the highway, the new 2-liter engine paired with that extra gear in the transmission yields an impressive 28 MPG. Strangely, the CVT automatic WRX has to stop significantly more frequently at the pump, managing only 25 MPG on the freeway. You should just not buy the automatic. Problem solved. Unsurprisingly, the WRX STI, with its older, more powerful engine, is a bit of a guzzler with a combined fuel economy rating in the teens. All non-STI WRXs come with electric power steering, MacPherson Strut front suspension, rear double wishbone suspension, 12.4-inch ventilated front brake rotors, 11.3-inch rear brake rotors, dual piston front calipers and single piston rear calipers. WRX STIs come with high performance suspension (front Struts, rear double wishbone), Brembo four-piston front brake calipers, Brembo two-piston rear brake calipers, 13-inch front brake rotors, 12.6-inch rear brake rotors, and a quicker ratio hydraulic power steering. Base: Base model. Starts at $26,595. Notable standard features: 6-speed manual, 2.0-liter flat-four, Active Torque Vectoring, Vehicle Dynamics Control, 17 inch aluminum wheels, 235/45 R17 performance tires, projector beam headlights, LED taillights, small trunk spoiler, quad exhaust system, manually adjustable cloth seats, 4.3” multi-function display, keyless entry, power windows, tilting and telescoping steering wheel, power mirrors, automatic climate control, 6.2 inch multimedia display, bluetooth capability, rear vision camera, front and side airbags. Premium: Base model with more features. Starts at $28,895. Notable standard features over Base: Power sliding moonroof, fog lights, heated front seats, 18 inch aluminum wheels, heated mirrors, wiper de-icer, different suspension tuning. Limited: Premium model with more features. Starts at $30,395. Notable standard features over Premium: LED headlights, leather trimmed power adjustable heated seats. STI: Extreme performance model. Starts at $34,695. Notable standard features: 2.5-liter boxer engine, Driver Controllable Center Differential, LED headlights, Torque Vectoring, hydraulic steering, high performance suspension, Brembo Brakes, unique 18 inch wheels, trunk spoiler, performance manually adjustable Alcantara/leather heated seats, dual zone climate control, 6.2 inch multimedia display, bluetooth capability, rear vision camera, 4.3” multi-function display, keyless entry, power windows, tilting and telescoping steering wheel. WRX STI Limited: Extreme performance model with more features. Starts at $39,995. Notable standard features over STI: 18 inch BBS wheels, Power moonroof, power adjustable leather trimmed seats, 7-inch multimedia display with Harman-Kardon speakers and navigation, blind spot detection and rear cross traffic alert. We’ve already shown you how much we love the standard WRX. We lauded its handling, its acceleration, its braking, and its gearbox. Then we drove the WRX STI, and while we still would highly recommend the base WRX with no boxes ticked, we think the base WRX STI, with its ability to out-handle cars costing three times as much, is the one to buy.